The temporary extra assembly line in Everett used to build Boeing 787 Dreamliners will shut down at the end of this year and be converted for use in early production of the forthcoming 777X jet. Boeing said Friday the temporary extra assembly line in Everett used to build 787 Dreamliners will shut down at the end of this year and be converted for use in early production of the forthcoming 777X jet. Two final assembly lines in Everett are currently producing seven 787s per month. Workers on the temporary line, known as the “surge line,” will transition to the other assembly line, which will step up production to match the rate from both assembly lines today. Larry Loftis, vice president in charge of the Dreamliner program, said the move will not result in any layoffs in Everett. According to the latest data provided to the state, the plant employs some 38,000 people, including about 19,000 production workers. Some workers on the surge line may move to other programs such as 777 or 737, Loftis said. The surge line was activated in 2012, envisaged as a temporary line that would serve to maintain the planned production rate until the Dreamliner assembly plant in North Charleston, S.C., came up to speed. The surge line’s last 787 will begin final assembly in October and will roll out of the factory at the end of the year, Loftis said. The manufacturing shift will come just ahead of Boeing’s plan to increase production of the 787 from 10 jets per month now to 12 per month, which Loftis said will happen in “the first part” of next year. That means Boeing will have to pick up the pace at assembly lines on both coasts. In Everett, the single 787 assembly line left will have to step up to build the seven jets per month that today requires help from the surge line. Meanwhile in North Charleston, the assembly line there will have to increase the rate from three 787s per month today to five jets per month. Loftis said switching to one line in Everett will enable the “smoothest transition” to the new 12 per month rate while at the same time allowing the 777X team to move ahead with its production planning. Bob Feldmann, vice president in charge of the 777X program, said that after the surge line is cleared out, the assembly bay will become the base for low-rate initial production of the 777X. The first 777X will go down that new line in 2018, he said. 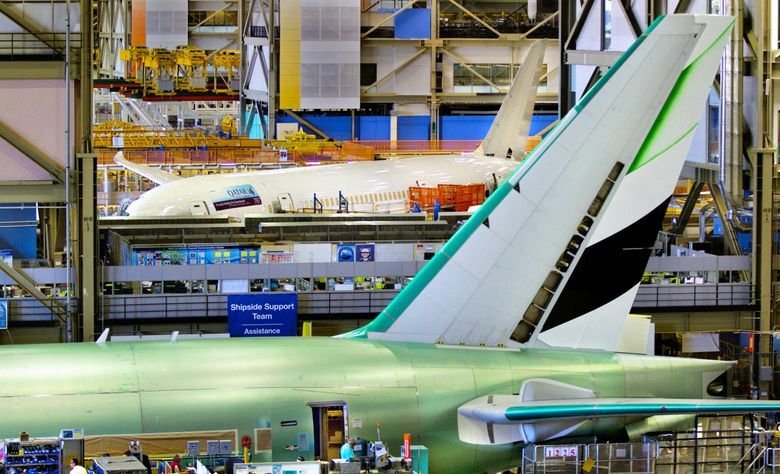 Even as plans for the new 777X jet proceed, Boeing plans to continue to build the existing 777 model on its current production line in the assembly bay next to the surge line. As production of the 777X rises in the early years of the next decade and the current 777 model is phased out, the main 777 line in the adjoining bay will also begin building 777Xs. Feldmann said the contracts to provide the tooling for the new assembly line have not yet been awarded. Boeing is already prototyping parts of the 777X that entail integrating the jet’s newest technology — including the giant composite wing, the wing-to-body join and the innovative folding wingtip — and “the technologies are all going to plan,” Feldmann said. He said Boeing will finalize the 777X’s design configuration later this year.